inset: Farid Arafat, the Branch Head of APLog Jakarta. On Friday evening, 16thof November 2018, PT Angkasa Pura Logistik (APLog) successfully relocated two aviobridges using special-sized trucks from their Cileungsi-based manufacturer, PT BukakaTehnik Utama (Bukaka), to Soekarno-Hatta International Airport in Cengkareng. Aviobridge, also called aerobridge or passenger boarding bridge (better known as “Garbarata” in Indonesian language) serves as a walkway to connect passenger terminal with an airplane. It extends from an airport terminal gate to an airplane, allowing easy access for passengers while boarding or disembarking. A subsidiary of state-owned PT Angkasa Pura I (Persero), APLog is a freight forwarding company that specializes in handling air freight, customs brokerage, exports-imports, and cargo inspection. One of APLog’s distinctive services, to name but a few, is project logistics,with various levels of complexity ranging from over dimension cargo or extremely heavy items, where special transports or multi-mode delivery becomes necessary. As part of safety consideration, Farid said, APLog made use of a100-tons load capacity crane, even though an 80-ton is already sufficient. The new aviobridges design are of Tunnel Glass type, from later generations. These are replacement of Tunnel Steel aviobridgesthat hadbeen in service since 1989 at Terminal 2 of the Soekarno-Hatta International Airport. While Bukaka’s aviobridges have been broadly used at most airports in Indonesia, the brand has actually acknowledged among foreign users region wide. Several international airports in Japan, India, Thailand and even in China (the competitor), also have their respective Bukaka’s aviobridges in place. Recent data from Soekarno-Hatta International Airport indicate that passenger walkway at Terminal 2 consist of 26 units. As Farid explained, “We have secured the contract from Bukaka to deliver four aviobridges. To this extent, tonight’s work order is simply a starter which comprising a total of 26 units, which have completed assembly in Bukaka’s Cileungsi plant." In addition to delivering the new units, one day earlier, APLog was also involved in removalof the out modeled aviobridges. “This one is a supplementary order – we are also awarded the contract to remove the obsolete aviobridge units. The dismantlement of the old aviobridges was carried out by Bukaka’s technical team. The units were later shipped by the same trucks. 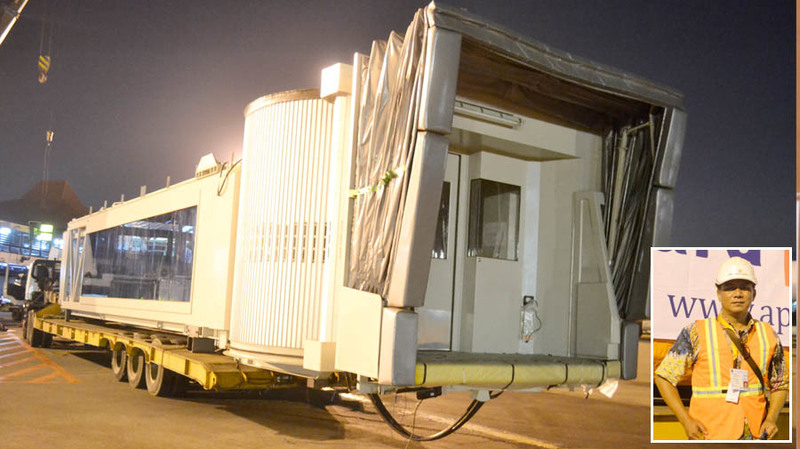 Then, the old aviobridges were taken to Bukaka’s warehouse premise near the airport,” said Farid.